The Robin (An Spideog) a friendly bird that many of us welcome to our gardens on a daily basis. This small garden bird is easily recognisable with both male and females having brown and grey plumage and a distinctive red feathered breast. Living in stone walls, hedgerows or even your garden shed the robin will make its home comfortable with a bedding of leaves and moss. Feeding on insects including garden earthworms the robins brave nature takes advantage of our gardening time, as we dig the soil the robin comes close keeping a look out for a tasty meal. During the winter when the ground is hard the robin will feed on berries or a seed mix provided by us and they love mealy worms. In March the robin will lay 5-6 cream eggs with brown/reddish speckles and throughout the breeding season may have 2-3 clutches. The juvenile robin is mottled brown in colour and within 5-6 months of leaving the security of their nest will have developed their distinctive red breast. Robins are one of the first birds to start the dawn chorus and will sing throughout the day and even into the early evening. Have you ever woken in the dark of night to hear a bird singing? In urban areas robins are known as one of the most common night-time musical birds. Street lighting, the quieter night-time environment for communication and even wind shaking the nest all contribute to the robin bursting into song in the dead of night. Have you ever wondered is it the same robin you feed from year to year? 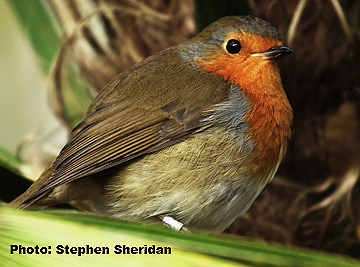 A report from British Garden Birds recorded that the lifespan of the robin can be up to 12 years with male robins known to be very territorial remaining in the same location all year. This entry was posted in Wildlife Watch at the Bog of Allen Nature Centre. Bookmark the permalink.